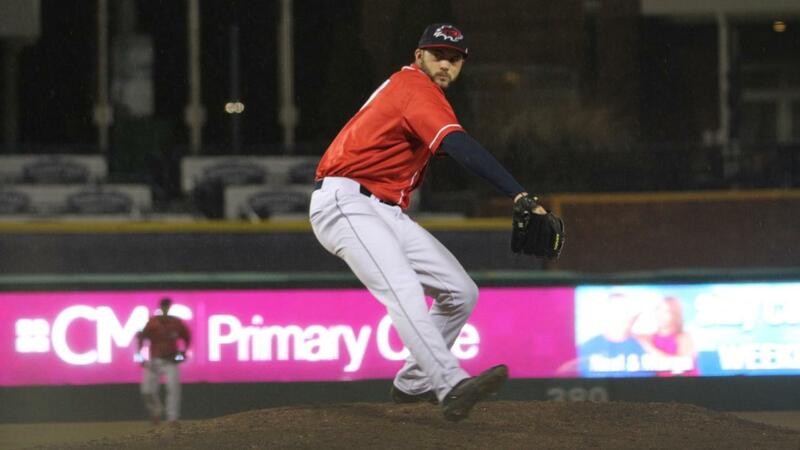 HARTFORD, CT - A three-run second inning and superb relief pitching helped the New Hampshire Fisher Cats (Blue Jays) beat the Hartford Yard Goats (Rockies) 4-2 on a rainy Friday night at Dunkin' Donuts Park. After a scoreless first, the 'Cats jumped on Hartford starter Ty Culbreth (L, 1-1) in the next frame. Alberto Mineo singled, Nash Knight walked and Chad Spanberger laced a base hit into right field to load the bases with no outs. Up stepped Vinny Capra, who smashed a ground ball through the hole on the left side to score a run and make it 1-0 New Hampshire. Kacy Clemens followed suit two batters later with a line drive single to centerfield to bring home the second tally of the stanza. The Fisher Cats scored their third run of the inning on a passed ball later in the frame to go up 3-0. Zach Logue got the start for New Hampshire and worked 4.2 innings in which he allowed two runs on six hits, walked three and struck out five. He gave up a solo home run in the second and surrendered another score on a fielder's choice. A two-out single from Kevin Smith in the fifth inning turned into an insurance run for the Fisher Cats, as Mineo cashed in with a double in the next-at bat to make it 4-1. Hartford's best opportunity to tie or take the lead came in the fifth inning. With runners at the corners, two outs, a run in and slugger Vince Fernandez - who homered earlier - at the dish, the 'Cats called on Jake Fishman (W, 1-1) to relieve Logue. The southpaw needed one pitch to end the inning, strand a pair and maintain a two-run advantage for New Hampshire. Fishman went on to work 2.1 innings in which he gave up one hit, struck out a batter and hit two but was otherwise solid. Kirby Snead (S, 2) twirled two shutout innings of relief to earn a six-out save and help the Fisher Cats tie the series and the Plymouth Rock Assurance Cup standings at 1-1. The 'Cats and Yard Goats meet again Saturday night in Hartford. RHP Yennsy Diaz (1-0, 0.00 ERA) will go for New Hampshire while RHP Rico Garcia (0-0, 2.25 ERA) is slated to appear for Hartford. Coverage begins at 5:45 p.m. and continues with first pitch at 6:05 p.m. on the Fisher Cats Radio Network.